I love to combine annuals with the goal of creating ultimate sensual overload. Proof: check out my eyeball-searing circus of a container planting, with super bright flowers that appear to swing through the air on upside down trapezes. But I realize one can’t continually decorate one’s patio or pathway with planters that can also be used to mark aircraft landing strips. It does get a bit much. So last year I tried working out a combination that would have a lot of impact without frightening the birds. Still, this new container combo has a little of everything–just the ticket if you’re gardening in a small space. There are plants with long lasting blooms and some aromatic herbs. There are leaves in a variety of sizes and shapes, three that are variegated and several that have a lovely soft velvet surface. And there are lots of romantic, pastel colours in contrast to the continuously flowering, bright pink Proven Winner’s Supertunia® Picasso in Purple™, a spectacular container plant new for 2017. Read on for the recipe and some handy notes. EXPERIMENT WITH VARIEGATION: Somewhere, someone once said that a little bit of variegation in a garden goes a long way. When a bunch of plants are all squished together in a pot, you’d think this sentiment would prevail. But this combo includes three plants with strikingly variegated foliage (Lemon Thyme, Sage, Periwinkle) and I think the effect is terrific. 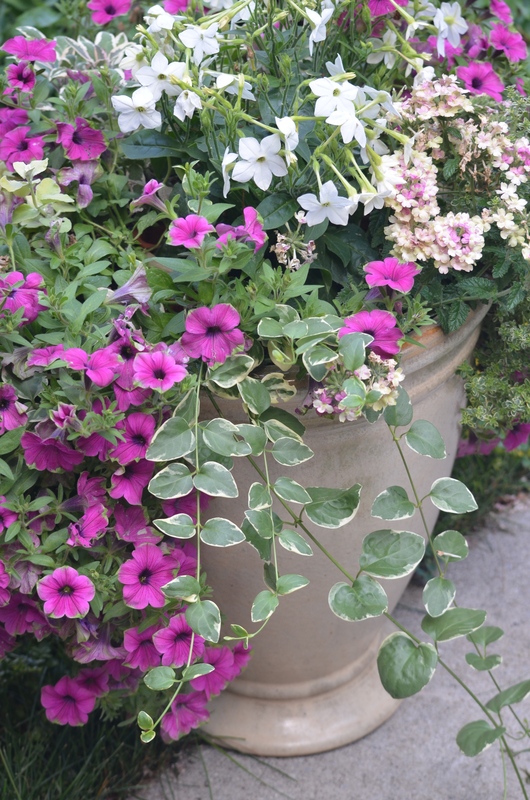 Breaking rules in a container planting is a wonderful way to experiment with colour and texture combinations. Some wonky combo you’ve fallen in love with may just turn out to be the inspiration for a new, full-size flower bed next year. MIX FLOWERS AND HERBS: If you haven’t already, next time you hit a garden centre in search of plants for a showy container, check out the displays of herbs as if you were looking over any other display of annuals. Forget that they might make a great addition to your next salad. Instead, concentrate on their potential as a thriller, a filler or a spiller. When I start to get bored with the usual choices for planters on offer at my local garden centres, I’ll often find a surprising shape, colour and/or texture I’d never considered before just by wandering over to the edible section. The sage and thyme in this recipe gave off glorious sun-warmed fragrances whenever I brushed my hand against them but the real reason I bought them was for their super soft, velvety foliage that filled in the combination and cascaded over the lip of the container. This combo can take some shade. Although you’ll find planting advice for Verbena, thyme and sage stating that these plants need full sun, this combo did fine in a position that got lots of morning and mid-day sun but was in full shade by around 2 p.m. All the other plants are good for Sun to Part Sun. Don’t over-water. Although all of the plants require average watering, several of them (thyme, sage, periwinkle) have no problem with dry soils. The Nicotiana and the Helichrysum actually don’t do well with generous waterings and the thyme won’t tolerate wet soil. Make sure to plant up this recipe making sure you’ve got good drainage. 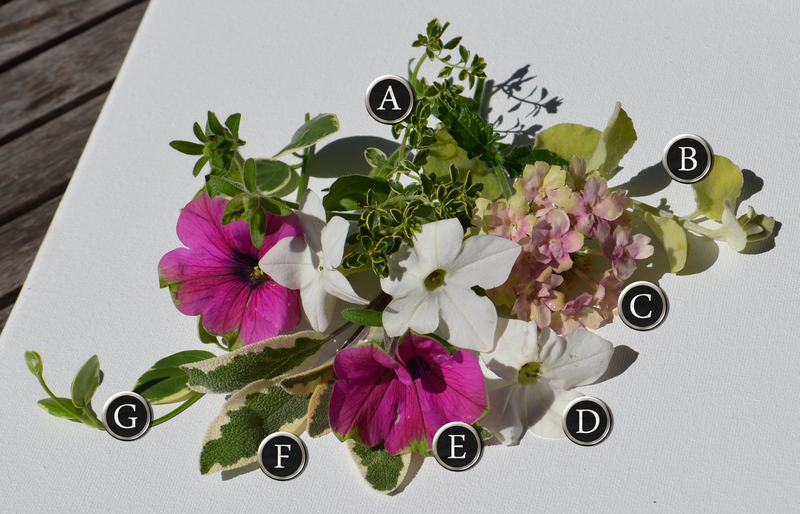 If you love the romantic take of this container recipe but need a combo that will thrive in the shade, check out my Moonlight and Marshmallows container recipe featuring a lush assortment of flowers, ferns and polka-dotted foliage.